This railway is open to passengers. The line is known as the "Clockwork Orange" and more officially as the Glasgow Underground. 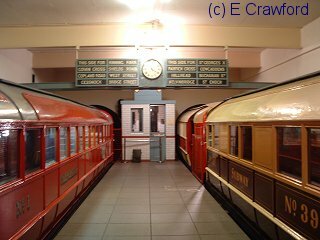 'Mock-up' of an old style Glasgow Underground station at the Glasgow Museum of Transport. 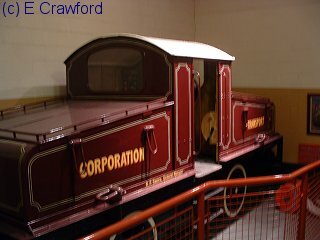 Subway electric locomotive at the Glasgow Museum of Transport. This line serves west Glasgow. It carries commuters, students to the University of Glasgow and crowds to Rangers' Ibrox stadium. This is a circular line under Glasgow. It runs from the City Centre to the West End, to Govan and back to the Centre. Subway station. The station here was originally called Merkland Street and was re-named when the Partickhill station closed and then re-opened on the other side of Dunbarton Road as Partick Interchange. Subway station. The original Kelvinhall station on the Glasgow Central Railway is closed, along with the line. Subway station. The original Kelvinbridge station on the Glasgow Central Railway is closed, along with the line. Subway station. The original Buchanan Street Extension, the terminus of the Garnkirk and Glasgow Railway, is closed along with the line through to Sighthill. Subway station. The original St Enoch, the terminus on the City of Glasgow Union Railway and used by the Glasgow and South Western Railway is closed, along with the line approach lines from the City of Glasgow Union Railway which is still open for freight between High Street East Junction and Shields Road. Subway Station. The original Bridge Street station is closed. It was used as a terminus by the Caledonian Railway and the Glasgow and South Western Railway until St Enoch and Glasgow Central stations were built. Subway Station. The Shields Road stations on the Glasgow and Paisley Joint Railway and the Glasgow and South Western Railway are now closed. Subway Station. The Glasgow and Paisley Joint Railway had a goods yard at Kinning Park, but after track removal this was removed in the early 1990s to make way for an industrial estate. Subway Station. The Ibrox station on the Glasgow and Paisley Joint Railway. Subway Station with the Broomloan Depot for maintenance of the Underground trains. The original Govan station on the Govan Branch is now closed and the line removed. A test track for the underground trains occupies some of the trackbed of the old branch.